In this work, n-type CdxZn1- x S and p -type PbS layers were optimized through chemical solution technique for solar cells. Cd x Zn1- x S was grown at 820 C while PbS was grown at room temperature utilizing aqueous conditions. Optical constants suitable for solar cells fabrication were investigated. Cd x Zn1- x S films had a band gap varying from 2.47eV (x = 0.6) to 2.72 eV (x = 1.0), transmittance above 79% in VIS - NIR region with resistivity range of 9.5×101 to 1.22× 102 Ω-cm. PbS had a band gap of 0.89 eV, transmittance below 55% with a resistivity range of 6.78 × 103 to 1.26 × 104 Ω-cm appropriate for solar cell absorber layers. Their solar cell had a short circuit current, Isc = 0.031A, open voltage, Voc = 0.37 V, efficiency, η = 0.9% with a fill factor, ff = 0.66. Thin films can be used to fabricate photovoltaic devices that can convert solar energy into electrical energy for various uses. This can be achieved if their structure, inter-band transitions and other optical properties are maximized to harvest enough solar radiation to provide energy. Activities that take place when electrons transit between energy bands in thin films are of fundamental importance in harvesting solar radiation (Chapin and Pearson, 1954). Solar energy is abundant but it has not been harvested well although harvesting it by use of solar cells does not require sophisticated and expensive facilities. Thin film nanotechnology has fabricated cheap photovoltaic cells that produce power for homes, small commercial uses or electric current (Schroder, 1998). Solar energy if a form of energy that is reliable, easy to maintain, install and it can extend to cover IR and UV radiation regions to make solar cells more efficient (Armin, 2009; Siu and Kwok, 1978). Solar cells absorb photons from the sun and convert them directly into electricity. They consist of a p -type layer which has a majority hole carriers and an n -type layer that has a majority electron carriers. When a photon with energy greater than the band-gap of the semiconductor passes through such a cell, it may be absorbed by the material and this takes the form of a band-to-band electronic transition producing an electron-hole pair. 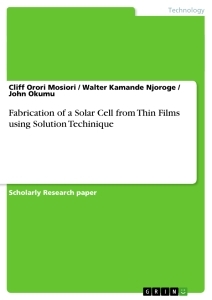 Several thin films have been fabricated and used to manufacture solar cells using various methods of preparation for solar cells that include chemical deposition; liquid deposition and chemical vapour among others have also been used. Many researchers have devoted their efforts to solution technique because it is a non-expensive method for thin film preparation. It has developed many noble materials. Doping using elemental dopants like boron (Khallaf et al., 2009), indium (Shadia et al., 2008), arsenide and chlorine (Amanullah et al., 2005) has produced suitable films for use as window layers. Ternary derivatives of CdS have generated a lot of research interest because of their varied applications in the field of optoelectronic devices. Cd1- x Zn x S which is gaining prominence as a good candidate for wide band gap materials for solar cells. Its band gap can be tailored to vary from 2.43 eV to 3.32 eV depending on its constituents and preparation techniques. The addition of Zn onto CdS enhance open-circuit voltage (Voc) and short-circuits current (Isc) in hetero-junction devices and result into a decrease in window absorption losses. Lead chalcogenides films grown by CBD possess a well-defined band structure in which their energy gap varies continuously between 0.41 eV to 2.7 eV depending on the method of preparation. Since their band gap ranges within the optimum theoretical band gap for maximum absorber material of about 1.5 eV, they can be used to fabricate solar cells (Popa et al., 2006). Glass slides were used as substrates, degreased in hydrochloric acid for 24 hours, washed with detergent, rinsed in distilled water and dried in air for 2 hours. They were inserted suspended vertically from synthetic foam which covered the beakers containing the bath solution. The bath composed of 0.038 M cadmium nitrate, 0.076 M ammonium nitrate, and 0.076 M thiuorea in de-ionized water. 25 ml of the each solution was taken into a separate beaker and de-ionized water added to top up to 100 mL, then heated to about 82o C. Using a burette, NH4OH (29.4%) was added drop-wise to maintain a pH of about 9. Glass substrates were inserted for 25 minutes. Varying concentrations of zinc nitrate [Zn(NO3)2] solutions were added to vary zinc ions and the value of x, (i.e. x = Zn2+/[Cd2+ + Zn2+] ) was varied from 1.0 - 0.6 according to the equation Cd x Zn1- x S. A reaction mechanism for the formation of CdS was suggested to be as shown in equation 2.1 where cadmium salts in the presence of ammonium hydroxide solution form the complex compounds. 'Amicable Solutions' in Trade Defence. What are the Political Economic Determinants of Accepting Price Undertakings in the EU?